There is a lot of graffiti in the beach area and it is not attractive. Most of it just seems to be youngsters marking out their territory, but it really makes the place look untidy. Occasionally, you see some that is artistic. Occasionally, it's amusing and bizarre. 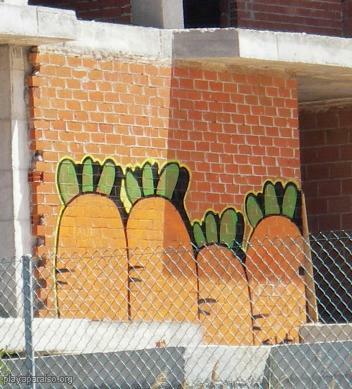 For example, why did somebody buy some paint, climb over the fence on a building site, fight through the undergrowth and then climb up onto the building, to paint four carrots on it?